Buy The iPad Air 2 Right Now From Apple! Yesterday morning Apple showed off the latest iPads that they added to their online store, in an ‘under-the-radar’ styled October 2014 Keynote speech. The two main talking points were the iPad Air 2 and the iPad Mini 3, and to be honest with you, there wasn’t much to really get excited about this year. The iPad Air 2 is now the thinnest iPad offering from Apple, and despite the first generation iPad Air being thin, the second generation is 1.4mm thinner at 6.1mm. Although there is a considerable thinning down of the new iPad, that’s about all the physical changes you can see, apart from the Touch ID ring around the home button. When we look at the performance we can see some definite improvements to the hardware, one of which is the A8X processor which is the same as the A8 one in the new iPhone 6, just slightly more powerful. A lot of the initial rumors were looking at a possible Retina HD display on this new iPad Air, but the screen is exactly the same as iPad Air 1, with one notable difference, being the reflectivity.You see, one of the major issues with iPads is they are quite reflective and you can often find yourself tilting the device in order to see the screen in well-lit conditions. A new anti-reflective coating is set to help solve this issue, and comes with the iPad Air 2. For those who love selfies you will be pleased to know that the rear-facing camera has been improved, climbing from 5MP to 8MP which comes complete with impressive features such as burst mode, panorama, slo-mo, timer mode and a popular time-lapse feature which has impressed on the iPhone 6. Apple have decided to pull the 32GB model from there line-up, which is going to annoy some people especially as they have kept the 16GB model in place. 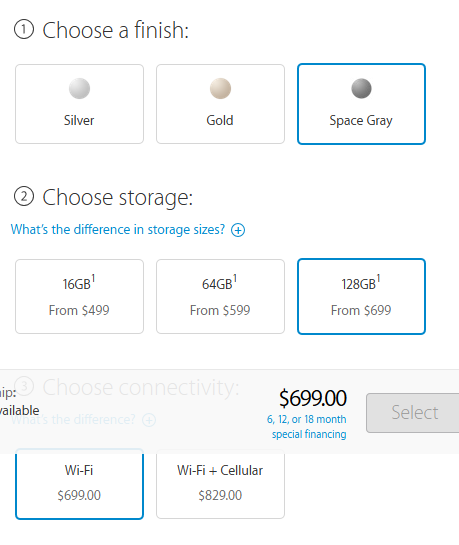 This means you have a 16GB, 64GB and a 128GB offering available. Due to the increasing sizes of Operating Systems, images and videos the 16GB probably isn’t the best option these days, so it almost seems like Apple are trying to influence people to go for the 64GB option. The iPad Air 2 is available to order as of today on the Apple site, and starts at $499, moving to $599 and finally the highest tier is the $699 128GB option. They all come in Silver, Gold and Space Grey color options. If you want the Cellular options then you just need to add $130 onto each of the above prices. The iPad 4 has now been discontinued, whilst the iPad Mini 1 and iPad Mini 2 will still be available for purchase, alongside our next talking point – iPad Mini 3. The iPad Mini 3 virtually looks the same as the iPad Mini 2 apart from the fact that Apple are now offering Silver, Space Grey and Gold as color options, and the introduction of Touch ID. Every other feature appears to be just the same as last year’s launch with battery life, M7 and A7 processor all the same. The prices for the Mini 3 starts at $399 for the 16GB version, rising to $499 for the 64GB model and the top end Wi-Fi price is 128GB at $599. Again, if you want Cellular you just need to add an extra $130 to each model tier. 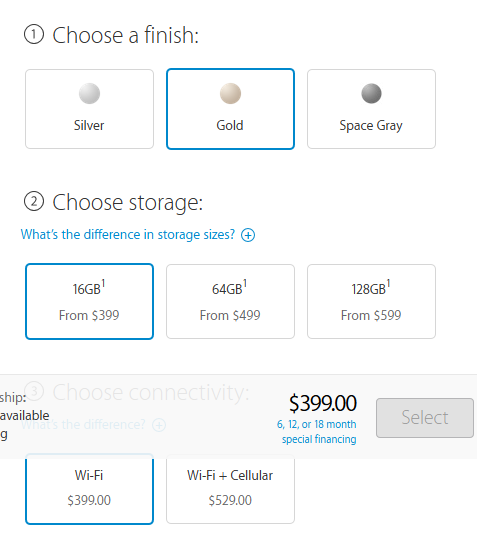 So the 128GB would carry a $729 price tag. 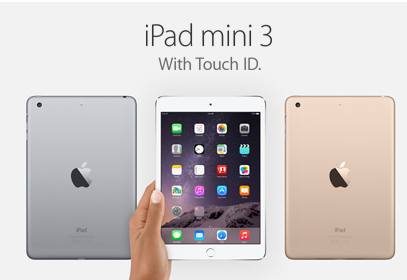 The iPad Mini 3 will ship from today.